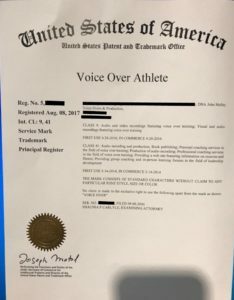 The Voice Over Athlete® is now an official Trademark registered with the United States Patent & Trademark Office (USPTO)! It took just about a year from my initial filing of the application and answering questions from the examining attorney at the US Patent and Trademark Office. Once the legal questions have been answered and everything seems to pass muster, the proposed trademark is published for 60 days for review and comment from the public. It can be challenged to see if anyone or any business has already made a claim for the mark. If it passes all of those hurdles the USPTO will register the trademark. We did it as demonstrated by the nifty image to the left! A Voice Over Athlete® Book is in production. The Book will be a combination of written copy and a series of videos demonstrating several drills that can help increase mobility and reduce tension specifically for voice performers who spend a lot of time at the computer recording/editing audio and general computer use.